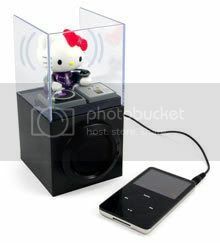 Whether or not you are a Hello Kitty fans, this Hello Kitty Action DJ Speaker would be the gadget that you wouldn't mind having. The famed cute Hello Kitty seems to be everywhere and could easily be anything you would expect from toasters to televisions, hand warmers and EVEN vibrators (what kind of vibrators?). 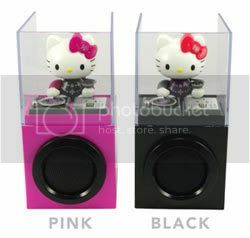 Hello Kitty in a DJ booth with a speaker in the base is simply one cool, awesome blend of dance music and Kitty. Heck, this kitten even bops her head back and forth with the music. Plug in your iPod or similar music playing device and observe the cuteness for yourself. It comes with 2 colours and will cost you US$24.99. Warning: It's hazardously cute!!! Click here to know more about this DJ! Have any of you ever wondered why piggy is always associated with money? Hmm..perhaps it has something to do with their "fat" factor huh? The piggy's "fat" may be very "fatt" (prosperous) to its owner I guess. That aside, let us have a look at this piggy then. 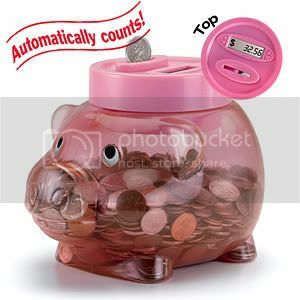 This Piggy bank counts and keeps track of spare change for you! Not to be mistaken with your normal "piggy"-this one is more high tech and it comes with electronic slot and LCD screen that automatically track and display your total savings. And unlike the oldy porcelain versions, with this piggy you need no breaking to get your prized treasure.s Just twist-off lid for bulk deposits and withdrawals. Wonder if this piggy will accept Malaysian coins though. It has a price tag of US$30. Affordable? Click here to see more of your piggy. Still remember when we younger we would have our very own collection of cassette tapes featuring our favourite artists? A cassette tape could equal to our total entertainment back then. But nowadays a MP3/MP4 player the same size can power a space station (and store your whole music and video collection). Now, the dinosouraus tape is redundant. That's what we call technology right? Time sure flies. Ok, this USB Tape Hun is self-explanatory right? 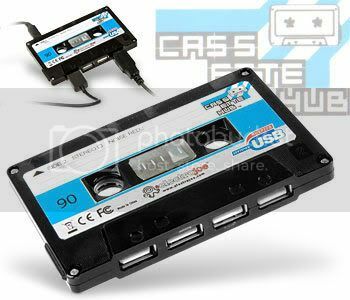 A regular cassette but with the ability to connect to another four USB devices. Get this iconic cassette at US$25. A tad expensive but it's a novelty right? For more information about this cassette, click here.